SAVE MONEY WHEN MAKING LOCAL or INTERNATIONAL CALLS & WHILST ROAMING! 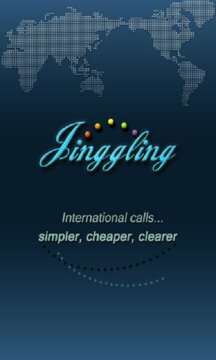 Customers Since 2011 – Reliable and FREE get the amazing JINGGLING APP with FREE starter credit – Save upto 80% when making Cheap International and local Calls upto 50% cheaper when Roaming – Doesn’t require Data or WiFi connection to carry voice, so the quality of connection is as good as normal GSM. Call your loved ones the good old GSM way, don’t SMS or waste time using VoIP apps, give them a quality call at the lowest rates available. Jinggling is SIMPLE, Just Dial international numbers directly from your NORMAL keypad prefixed with a "011" (USA) or “00” or "+" as normal. Or directly from your phone book, history or favourite contacts lists. Make Cheap international calls from any country and will work on ANY mobile network – no contract required, you can topup by PayPal, Credit/Debit Cards, Cash and Mobile Transfer. No expiry of balance. •Jinggling causes no battery drain like viber, skype or other VoIP apps – Jinggling uses only GSM voice. •Jinggling has no adverts or anonymous invites to chats or other annoying distractions. •Jinggling charges include all taxes applicable to the call, we don’t sting you with the tax afterwards. •Jinggling billing is accurate, we charge what we advertise and nothing else, look at the rates live in the app. Multilingual – German, French, Spanish, Greek, Chinese, English and Arabic… more coming soon. With JINGGLING there are no fiddly numbers to dial, no PINs to enter, no Changes in way you make a call simply dial from you normal keypad and talk. Just experience calling low rates. No need for a second handset or new SIM card. Its like a smart calling card, always finding you the best rates. • All Calls through Jinggling – ideal for PAYG customers or users that would not like to use their existing bundled minutes. Select the mode through the menu it’s that simple – you are in full control Jinggling just keeps things simple and affordable, so you can stay in touch with friends and the people you love, for less. Use Jinggling to make cheaper local calls, if you have a PAYG contract switch to Jinggling and save money when making calls within your country. Jinggling does not use your bundled minutes and no local access number is dialed. No connection or disconnection fee is charged. No hidden charges at all, we simply bill usage by the minute. You have a live balance within the App so you can check amount remaining anytime. Go online and see all of the call records, topup' and balance. Customers using Skype, Viber, Local call, FooCall, ChatTime apps or Calling Cards are missing out. Instal the rollsroyce of cheap international calls JINGGLING. Call for only cents per minute, no hidden charges, connection charges or inapp purchases. Enjoy for a limited time with free download BONUS CREDIT to try some FREE CALLS on us to test our service and quality! Jinggling is high quality we use the most premium GSM routes. Hear it to believe it!